6 drawings on paper (1 sheet) : ink ; 9.5 x 6 in. Ink portraits of six men from the neck or shoulder up, identified by inscriptions. Top left sketch of Mr. S. Fujita of Hilo, Hawaii is drawn at 90 degree angle, with head facing down ; viewed in profile from neck up with mustache and glasses. 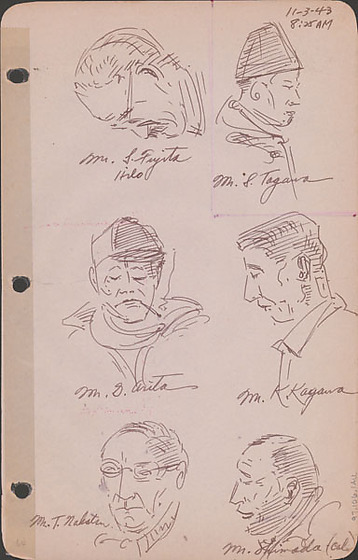 Top right sketch of Mr. S. Tagawa depicts a man from shoulders up wearing a brimless hat, facing right. Middle left sketch of Mr. S. Arita depicts a man with downcast eyes wearing a cap facing viewer as a smoking cigarette hangs from the edge of his mouth. Middle right sketch of Mr. K. Kagawa depicts a man in profile with strong profile with downcast eyes. Bottom left sketch of Mr. T. Na[unreadable] from collar up wearing glasses and balding. Bottom right sketch of Mr. Shimada of California in profile from neck up with eyes closed and balding. Drawing 97.106.1AV on verso on same sheet. Written in black ink, top right corner: 11-3-43 / 8:25AM. Written in black ink, below each image: Top row: Mr. S. Fujita, Hilo, Mr. S. Tagara ; Middle row: Mr. S. Arita, Mr. K. Kagawa ; Bottom row: Mr. T. Na[unreadable], Mr. Shimada (Cal.). Written in pencil, bottom left corner: 64.